‘Compassion, humour, ruthlessness, and honour’ – Attributes Maxine Sanders thinks a witch must have. As it was St Patrick’s Day the other day, I’ve been thinking about what that means to us all. To the world, it appears to mean dressing in green, and getting pissed usually with a green-coloured drink, and generally celebrating being Irish. That’s what it means today. I’ve have some great St Patrick’s days in the past, as all those things above – I’ve worn green, gotten drunk and had fun with friends at various Irish pubs. But I’m not Irish and it seems that does not matter these days. I’ve never seen a problem with celebrating it – apart from the fact that it’s a pagan acknowledging a Catholic Saint (I have a St Christopher in my car, even though he was rejected by the Vatican and now adopted, from what I’ve seen, by the pagans). But these days a few of the pagans I know out there prefer not to celebrate St Patrick’s day due to the unknown truths about St Patrick. And I kind of agree with them. From what I’ve read, I’m inclined to think that we’ll never know the truth about what Paddy ever really did. When you learn the truth about St George, you begin to wonder what on earth Saints have to do with certain areas, myths and beliefs. 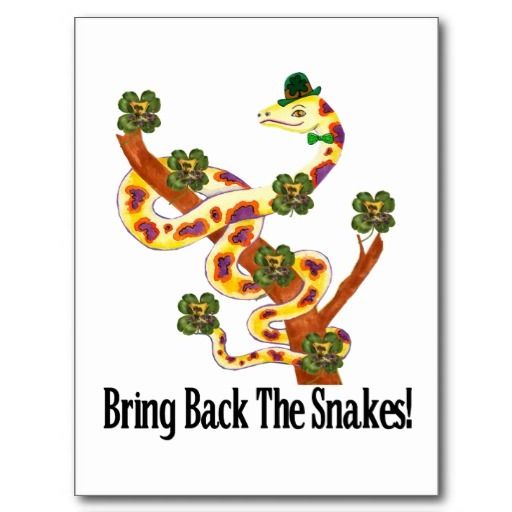 St Patrick was believed to have rid Ireland of ‘snakes’ but that deceptively means ‘pagans,’ as there were not any snakes living in Ireland at the time. Patrick was actually Welsh (some say English, others Scottish), kidnapped into Ireland, stayed faithful to Christianity and then decided that ALL the Druids and Pagans of Ireland were miserable buggers that clearly needed converting. I’d say a lot of them did (for reasons of their own) and a lot of them didn’t, but they should have had a choice. I don’t think missionaries care to know anything about someone’s choice. Here is the research of an Irish-American Pagan on St Patrick and all the pagan/druid history – she says that Paddy had no great luck converting the Irish pagans anyway. In his lifetime, he would not have had the chance to convert all of Ireland anyhow. Pagans still lived there centuries later. So why do we bother with it, and him? This blogger says it’s all about being Irish these days, and she’s right. Still, I’m inclined to believe that the Christian faith left out all the horrible bits their saints did so as to look as if they are all innocent. Either that or they have no idea how it truly was, being the Dark Ages when most of the more popular saints apparently lived. Pagans won’t ever fall for that, and I’d make sure of it. Pagans can celebrate the day, stand dead against it, or not care about it at all. I’m the latter these days. But I’m happy for any Irishman to celebrate what they please. I try very, very hard not to get hoity-toity. Not to get cranky and snobbish towards “city” pagans. It’s important to respect that everyone is on their own path. Sometimes I have to try harder than usual. Like the time that, not long ago, I met a witch at a large pagan event in a forest. A high priestess, no less. She and her coven were lovely people, and I could’ve sat and spoken to them all night, had I not gotten so upset (not to mention outright worried) after one of our first exchanges. Galloway: Anyway, it was great to meet you. Have you been to (this event) before? High Priestess: No, it’s my first time. I’ve never even camped before! (The coven) don’t really do outdoor rituals. I’m what you’d call an urban pagan. HPS: …Yeah, I’m not big on outdoors. <She motions to a copse of pine trees nestled among the eucalypts>. So… Are they natives? Or are they pine trees? Most pagan writers, particularly those who write books on Wicca, will agree with Ms HPS. Although many Witches meet, and work, outdoors – perhaps in the corner of a field or in a clearing in the wood – it is not always possible for everyone to do that. Many live in cities and towns and are unable to get out into direct conact with the Earth. This does not mean they cannot function. Your temple can be an indoor or outdoor one. Sure. An indoor altar/temple works really, really well for day to day practices/blessings. But I tend to disagree after this point. Paganism, after all, is an umbrella term for an ever-increasing number of nature religions. Now, I may be missing something here, but if you are a nature worshipper wouldn’t that mean you would actually have to spend some time with nature? No, this is not a call for each and every remotely pagan-ish person to strip off and disappear into the bush. I am not anti-indoors, or anti-modern age. The internet, especially, has kept pagan folk connected through online discussion groups, forums, mailing lists and so on. More and more people are using Facebook to publicise their pagan events, and countless others run online pagan stores for books, supplies, clothing… you name it. But what many – including Ms HPS – seem to be forgetting is that, behind all the panne velvet, cheap jewellery and silly names, pagans are nature-worshippers. Or at least they should be. For me, this means some aspect of their practice should be outside, even if it’s once every now and then. Like Bucky says, circumstances don’t always allow for a full-blown outdoor ritual. I have heard of a couple of surprisingly poignant lounge-room rituals, and some of my favourite footage of the likes of Janet and Stewart Farrar and others shows even they performed indoor rituals from time to time. But unless there is absolutely no alternative, it is important to make an effort when and where you can. Make an effort to cover modern appliances, regardless of how retro-chic they may be. Increasingly, the indoor/outdoor debate is becoming a real “wheat from the chaff” exercise for me. I am inclined to agree that the modern pagan has become quite “outdoor phobic”. If you never leave your loungeroom, if you never sit in the sun or wind the windows down in your car, if you make excuses about it being too hot/cold, if you see no power in the still that comes just before a ritual outside on a windy night… Well, perhaps you need to re-assess why you have chosen this spiritual path. I work hard at not being hoity-toity. I still think city covens are fine, as are city pagans. I just think it is important that they embrace the country and the outdoors from time to time, rather than avoid it at all costs.